Reviewing the fiscal year 2012-2013 (FY 2013), I have a feeling of anticipation and excitement for what lies ahead for HSF. We have just experienced a year of major transition, and there is more to come, as we expand to meet rapidly growing needs. During the first three-quarters of this year, as a continuing member of the Board of Directors, and then, throughout the final quarter, when I began my tenure as President and Chief Executive Officer, I had the unique privilege of anticipating, participating in, witnessing, and ultimately, leading, a historic turning point for our organization. FY 2013 marked the start of a systematic project, spearheaded by the Board, to redirect the organization, in order to better meet the needs of today’s rapidly growing and increasingly diverse population of Latino college-bound students – and their parents – across the United States. The Board’s goal was to lay the groundwork for new leadership to commence a full-court press, starting in early 2013. A big step – and testimony to the Board’s commitment – was consolidating our operations and significantly cutting costs by relocating to the Los Angeles area. Those of us involved felt we had truly entered a new era, when we moved into our new office space in Gardena, California in November. Another major step was starting the process of attracting new talent to the organization –individuals who could lead the many initiatives we had on the drawing board. Our Chief Financial Officer, Fernando Almodovar, was the first to join the new lineup in July 2012. HSF’s Chief Information & Marketing Officer, Marcela Bailey came on board in February 2013, rounding out our year of transition. Fernando, Marcela, and I and our Board of Directors are inspired by HSF’s proud history and amazing legacy. We take the baton from our predecessors with a deep sense of the responsibility entrusted to us and an equal amount of excitement, as we begin to put our own stamp on the future of HSF! In April 2012, HSF had a small handful of staff, including contingents in Denver, San Francisco, Georgia, and New York. As part of a larger initiative to update the organization’s goals and effectiveness, HSF’s Board of Directors made the decision to consolidate operations and move HSF’s headquarters from San Francisco to Toyota’s corporate offices in Southern California. Toyota offered HSF an opportunity to rent office space within its signature building, Toyota Plaza, located in Gardena, California. In May, HSF secured a three-year, $3 million grant from Wells Fargo, the largest corporate donation HSF had ever received, to date. Chief Financial Officer Fernando Almodovar was hired in July, bringing a wealth of experience from the corporate and non-profit sectors to his new role, including having served one of the largest CPA firms in the U.S. and stints in consumer products that took him to markets in Mexico and throughout South America. Fernando’s first major tasks were shutting down the operation in San Francisco and moving it to the Los Angeles area. This was the first of many additional transition-related responsibilities he assumed at the time. Another major step Fernando implemented was hiring a new finance and accounting team, a process he had completed by the end of the fiscal year. Under Fernando’s leadership, preparations for the move to Southern California took place throughout the summer and fall of 2012. In October, as transition activities continued, HSF began negotiations for a possible merger with the Hispanic College Fund (HCF), headquartered in Washington, D.C. Founded in 1993, HCF’s mission was to prepare the next generation of Hispanic professionals by awarding scholarships and working with high school and college students through various field programs. The move to HSF’s new headquarters in Gardena, California took place in November 2012. 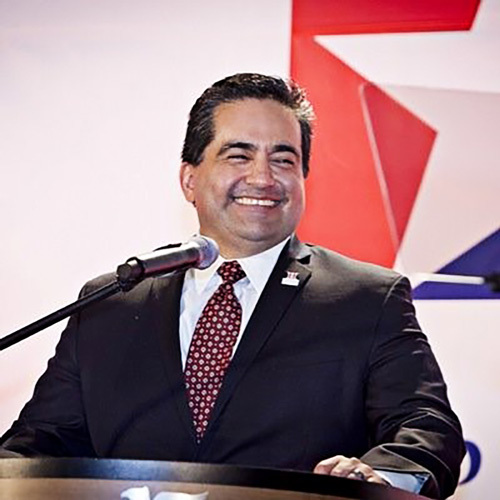 On January 2 2013, Fidel A. Vargas began his tenure as HSF’s new President & Chief Executive Officer. Fidel came to HSF directly from a seat on our Board of Directors and from being a founder and managing partner of a private equity firm that managed over a billion dollars in assets. As a six-time recipient of HSF scholarships that led to degrees from Harvard University and Harvard Business School, and a distinguished career in both the public and private sectors, Fidel brought HSF an unusually diverse range of skills. The Board viewed his love of numbers, experience in investing and managing capital, and his long history with, and allegiance to, the organization as being particularly relevant to leading the team through a magnitude of change HSF had not seen since its founding in 1975. HSF 2.0 began with the vision that we would develop the capacity and scalability within our office to utilize the best technology, process automation, and analytics to enable the organization to grow and advance. Technology would provide the means to achieve the most efficient operation possible, including streamlined fundraising, internally and from the donors’ perspectives, while increasing substantially the engagement of Latino families, HSF Scholars, Alumni, staff, and supporters, through socially networked communities and tightly coupled Social Media, Digital Marketing, and the full power of the latest and best Information Technology. From that point, on, transparency and engagement became the guidelines for working with HSF’s existing vendors and new corporate partners, as well as internally. For example, the senior team initiated Open Communications and Best Practices programs for the staff. The senior team developed and drafted a Restructuring Plan, which was approved by the Board of Directors in March. That month, the Team also reached out to confer with a top innovator. They traveled to Chicago to observe and gain insight from President Obama’s Technical Advisory Team. We met with Rayid Ghani, Chief Data Scientist of the “Obama for America” campaign, as well as Dan Wagner, Chief Analytics officer, Dylan Richards, Director of Engineering, and team members Gabriel Burt, and Kit Rodolfa. We gleaned insights to President Obama’s strategies of using data and analytics to reach out to America during two successful elections, and how we might incorporate these, or similar strategies, into HSF’s overall roadmap. We closed our books for FY 2013, showing a distribution of $36.4 million in scholarships – the largest number of scholarship dollars awarded in one year, from the time of HSF’s inception. By the end of 2012, we had also surpassed the $400 million mark in the number of scholarships awarded, since our founding. Our cost structure showed that HSF was spending 91 cents of every dollar donated, on scholarships and programs, with 83 percent of each dollar going directly to students in the form of scholarships. .
Fred R. Fernandez & Irma R. Rodriguez Foundation, Inc.